Don't we all wish our fridges looked like this?I am ashamed to admit this, but it seems to happen every night. I go to the refrigerator in search for something to satisfy my midnight hunger pains, but the problem is I never know what I want, and end up staring mindlessly -- fridge wide open. My chronic indecisiveness, however, is wasting a whole lot of energy. 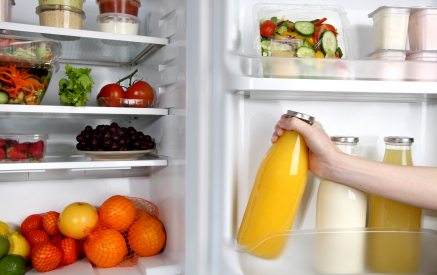 According to Home Energy Magazine, opening and closing our refrigerator accounts for 7 percent of the appliance’s energy use. It’s something that many do subconsciously, and before you know it, minutes have gone by. Along with the cold air that is working to keep food fresh, warm air begins to enter and your fridge’s compressor must run to even out the temperature. If that percentage doesn’t seem substantial, consider this: The Institute of Food and Agricultural Sciences at the University of Florida says that poor refrigerator habits (i.e. leaving the door open) waste 50 to 120kWh a year. Save 50kWh, and you could run your dishwasher 20 times. Save 100kWh, and you could run your washing machine 50 times! That's a lot of potential to lower monthly energy bills. Every little decision counts. For me, last month’s bill was an amount to make anyone cringe, and an effort to make a decision before opening the fridge door is definitely worth my time, and money.